You can taste garlic in almost all Korean dishes. We love garlic, ginger and chillies. Yes, it leaves you a bad breath after eating them or even next day, but it’s a tasty addition to other dishes and has many medical properties. Strong immune system: fight against chest infection, coughs and congestion. Great for colds and flu. I bought a bunch of garlic from the local veggie market a couple of days ago. I use a garlic clove or two when I’m cooking, but there was no way I can finish 10 heads of garlic before it goes bad. So I decided to make some garlic pickles and roasted garlic. Peeling off these little guys can be tricky. Let me tell you I feel like I can still smell them in my fingers. An easy way is open up the cloves and put them in a bowl. Place the same size bowl on top to create a dome. Then vigorously shake them. Clean the peeled garlic in cold water with a squeeze of lemon. To make garlic pickles, I peeled off about 5 heads of garlic. Rinse off any dirt or skin. Boil vinegar, water, peppercorns, bay leaves and dried chilli in a pot. Add garlic cloves into the pickling liquid for a few minutes. Then transfer to the steralised jar. Cool down and put it in the fridge. It should be ready to eat in a week or so. Then I made oven-roasted garlic with the remaining. Simply cut the top of the cloves with a sharp knife, Drizzle a couple of teaspoons of coconut oil and add a sprig of rosemary. Put it in the preheated oven (180) for about 40-50 minutes until the cloves are soft and tender. It smells amazing while cooking in the oven and tastes so beautiful and sweet. It just melts in your mouth. You can easily mash with a fork. Spread on the slice of bread, add to the potato mash, hummus and soup, or eat just by itself. Because I usually put my lunch in a bowl and eat (less dishes! ), I don’t normally decorate my lunch plate unlike dinner that is more a shared affair. But looking at beautiful roasted garlic out of the oven, I had to make myself a pretty looking lunch today. 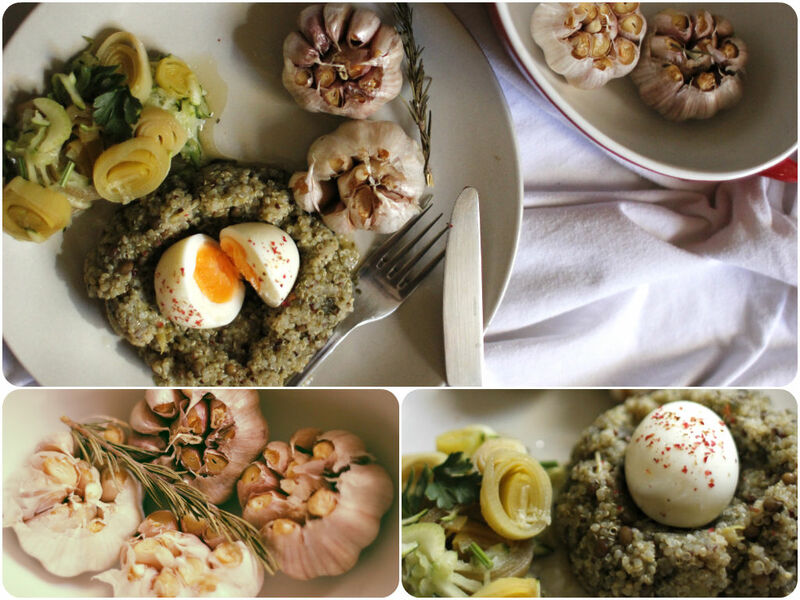 A semi-boiled egg on the quinoa nest, braised leeks and zucchini, and of course garlic on the side! Yum yum yum..